Okay, let’s assume for a moment that the Nintendo Switch is going to be the biggest thing since sliced bread(aka since the Wii.). Like anything that gets popular it’s going to receive add-ons, it’s going to receive some sort of upgrade or spin-off. It will evolve. This article is basically going to be me rehashing things I’ve brought up before, but in one convenient place, and after you’ve read through it I want you to tell me in the comments below which of them you would prefer to see become a real thing. By now you’re familiar with the ongoing debate as to whether or not the Switch is a console or a handheld. Well I’m not here to have that debate. What am I here for is to suggest a portable-only version of the Nintendo Switch. Basically put, you take the Switch Dock, HDMI Cable, and Joy-Con Grip out of the box, leaving you with the Switch console itself, the Joy-Con’s, and a USB-C cable for charging. Removing the grip and dock from the bundle drops the price to $199.99 creating an entry-level Switch device that is all about its portability with no TV functionality. No other major functions are altered and if you wish to get the TV functionality all you need to do is purchase a dock and an HDMI cable and boom, you have a full-fledged Switch system. I’ve got no image for this, but I imagine you can picture it in your head all the same. 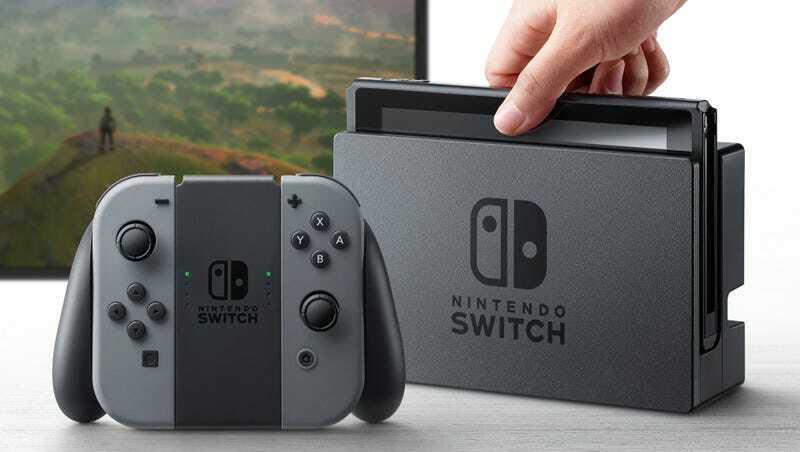 Just like how the Xbox and PlayStation get slim versions after a few years, the Switch would also get a slimmer, sleeker version that more easily fits into your pockets, but the Joy-Cons are now permanently attached to the device because they are now too small to be used as standalone controllers, there’s no dock, and no grip. The Switch Mini is around the same price as the Switch Portable talked about above if not a little less because of its smaller form factor. This version of the Switch existing would completely rely on NVIDIA managing to shrink the chip used in the Switch and still being able to fit some of the advanced tech of the Joy-Cons into the smaller side controls like the HD Rumble, Gyro’s, and NFC Reader. This one is based on actual rumors and a patent regarding a supplemental computing device and more powerful dev kits that went out in October. For ease of understanding I’ve taken the liberty of suggesting it will take the form of a dock. This new Dock 2.0 will have a powerful GPU and maybe a more powerful CPU tucked away inside of it and when you connect the Switch console to the Dock 2.0 the systems power will increase dramatically and if the rumors are right it will hit somewhere between 4.5 and 5.5 teraflops of compute performance, putting it above PS4 Pro’s 4.2 teraflops and below the Xbox Scorpio’s 6 teraflops. This would make the Switch capable of outputting general graphics better than the PS4 Pro and displays games at upscaled 4K resolution. Because this dock would be an optional accessory it might not be supported by all developers(Nintendo will 100% support it with their first party titles. ), but it is likely to attract more third party support and potentially be cheaper than the Switch itself at around $150 to $250 and undercut both the PS4 Pro and Scorpio. It will also likely come bundled with the Switch eventually. One downside is that it may cause some games to perform noticeably worse when portable due to the massive power difference and some developers may opt to make their games only playable when docked. So there you are, three years into the Nintendo Switch’s lifecycle, and then suddenly, Nintendo announced the Switch 2.0. It’s the same form factor with the same Joy-Con controllers and accessories, but it’s more powerful than the Switch 1.0. You just trade-in your Switch 1.0 console, buy the Switch 2.0, and insert it into the dock you kept. Basically it’s the opposite of the Switch Dock 2.0 and you’ll probably pay about as much as you did for the Switch 1.0. 5) Nintendo Switch Failed, What Do? 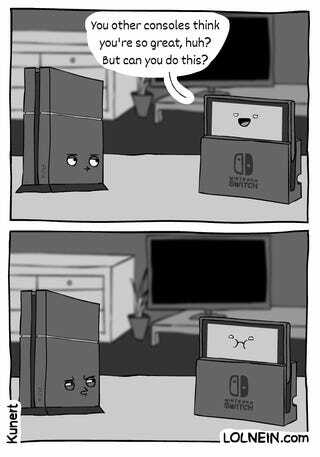 In the event that the Nintendo Switch fails what will the future hold? Well, first thing we’ll see is a new dedicated handheld that will officially replace the 3DS in 2018. And then we’ll see Nintendo crank out more mobile titles to make loads of cash to offset the Switch’s failure. However, they’ll probably make another dedicated home console due for release in 2020 except this one will directly compete with whatever PlayStation and Xbox systems are on the market at the time, for arguments sake we’ll simply say the Xbox Scorpio and PlayStation 5. Nintendo isn’t likely to go third party and their management has basically said as much meaning they’ll dig into their massive war chest and keep on plugging away. However if that console fails too then yeah, they’ll probably cave and partner with Sony or merge with Sega because Xbox sells like crap in Japan.